With the Internet, it is easy to see a very wide variety of fixtures. Print out pictures of what you want before looking for a builder so that you can include specific brands and models. Write down the web site for each fixture so that you can find it again. Models come and go, so if it is something you absolutely love, you could order it yourself right away and put in your specs that you will provide the fixture. We have posts at the street end of the driveway with lights on them, but had not discussed if we wanted the lights controlled by light sensor, motion detector, timer, or light switch in the house. We decided to use light sensors, but the drawback is that the lights are on all night every night and even all day when overcast. A better alternative for post lights might have been to have them controlled by an inside light switch. Update: With extremely low wattage florescent bulbs in the posts, it doesn't really matter if the lights are on all the time because they use so little energy and last so long. An advantage to using post lights on a switch is that you can also put a plug on the post for plugging in leaf blowers, edgers, holiday lights, etc. If the lights are on a sensor, a separate line would have to run for the plug (unless the sensor is out at the post as well). At the front of the garage, we chose the same kind of canned lights we are using inside. When the electrician first asked us if we wanted to control those lights from a switch at the front door of the house, we said no, because we would be coming in the side door, where we come in from the detached garage. We quickly re-thought that decision and had those lights switched at the front door when we realized that most of the time we would be using those lights would be when company was coming or going (via the front door, usually). We also added some lights controlled by a motion detector so that the lights would come on automatically when someone drives or walks up. With all the bugs out here, we don't want to have to leave lights like these on any longer than necessary, plus they come on automatically and light up the driveway when nobody is present to turn on the switch inside. On the other corner, one of the two lights, again, points at the driveway, and the other points to the yard to the side of the house. The directions which came with the lights said not to put to sets of motion detector lights on the same circuit. We're not sure why they say this, because these front garage lights are on the same switch and work fine. Judy also has the option of turning the lights on manually from the switch, but they will time out and turn off after a few minutes (whatever interval you set them for). The right side of Judy's garage has a "people" door to the side yard. Another set of motion-detector lights are above that door. Two more sets are in the back yard, one at each end of her patio. By putting the lights off the end of the patio, it will help keep bugs away from people sitting on the patio. On each of those two sets of lights, one flood is pointed at the patio and the other, into the woods behind her house. Although there is a motion detector on each set, it is disabled so that the lights can be turned on from the switch without their timing out. Street Lights: Part of your monthly utility bill is a charge for street lights. You will probably have one very near your house when it is completed (if there isn't already one there). Since the street lights come on automatically when it gets dark and since the chances are good one will be near enough to your driveway to light it up, you may not actually need outer garage lights at all (although you may want them for cosmetic reasons). The same applies to post lights at the end of the driveway, though the posts are mainly decorative. Our garage is not near the street, so while the street light illuminates the street end of our driveway, it doesn't help out around the garage, which is why we put the motion lights in. Judy has a very short driveway, but they did not put a street light next to her house, so she still needs the outside lights. An alternative to having bug-attracting floodlights on the front of the garage is to put low-voltage lights along the side of the driveway with a switch by the front door for turning them on/off. If you are going to have landscape lighting, you will probably want an inside light switch for them as well. If you might want to hang lights around the edge of your roof at Christmas, you might want to get some electrical outlets put under the eaves to plug the lights into, and also make those plugs switch controlled from inside. These are examples of things that if you don't ask for, you are not going to get, even though they are not high-cost items. You have probably seen solar-powered landscape lights. These are okay for marking the edges of a driveway, but they do not put out much light. The are not adequate for accent lighting of a tree or wall, for example. In locating lights for the deck, we again tried to keep the lights as far as possible from the seating areas to reduce the number of bugs. We put floodlights under the eaves of roof over the 20' high ceiling, however, we later found out that the bugs don't stay up there; they are attracted by the high lights, and then come down to the deck. It wasn't easy to figure a way to light up the front porch without having the lights there attracting bugs. As soon as a front porch light is turned on, bugs swarm to it, then as soon as the front door is opened, the bugs are inside. A possible solution might have been to mount some floodlights on trees in the front yard and point them at the front porch, but we didn't think of this in time. A compromise between lights by the door versus lights on trees would have been to put lights on the front of the front porch posts. This would have moved the bug collection point back several feet. We tried using yellow "bug light" bulbs, but have seen bugs swarming around them. Bugs may be first attracted to lights in the house and then by the heat of the yellow bulbs, but the bottom line is that the yellow bulbs are not effective. On Judy's house, we put the floodlights away from her front door and off her patio, as described above under Garage Lights. The house still has a standard porch light in case she is not as bug-a-phobic as I am. 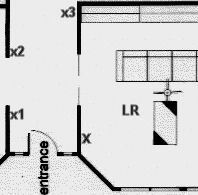 Check the blueprints carefully for the location of light switches. Light and fan switches for a room should be located by every doorway into a room unless you want to have to walk across the room in the dark. Doors should not block the switches when open. We read an article once about builders putting light switches in all kinds of inaccessible or inappropriate places, so don't just assume they will put them in the correct locations. Switches (and wall sockets, for that matter) should be put where they will not be blocked by furniture such as large book cases, china cabinets, etc. Wired switches cannot go where pocket doors recess into walls. Because of the double pocket doors into our living room, pictured left, the LR light switches had to be located well away from the door opening, requiring us to stretch behind the TV to use them. In hind sight, we actually would have been better off putting the switches at location "x1", "x2", or "x3". While it may seem odd to have the switches outside the room, it would actually be easier to get to them in one of those other places as we enter or leave the room. Another alternative would be wireless wall switches which look just like regular switches but work by radio waves. 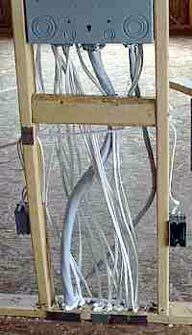 Since they require no wires to run through the walls, they will not interfere with pocket doors and could be place right next to the opening. 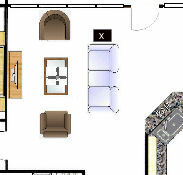 With a plan like the one at left, electricians will put electric and phone outlets around the walls, and if you want a lamp or phone on the black table (with the "x") by the sofa, you will have to run wires across the floor, which would be unsightly and also run the risk of people tripping on them. 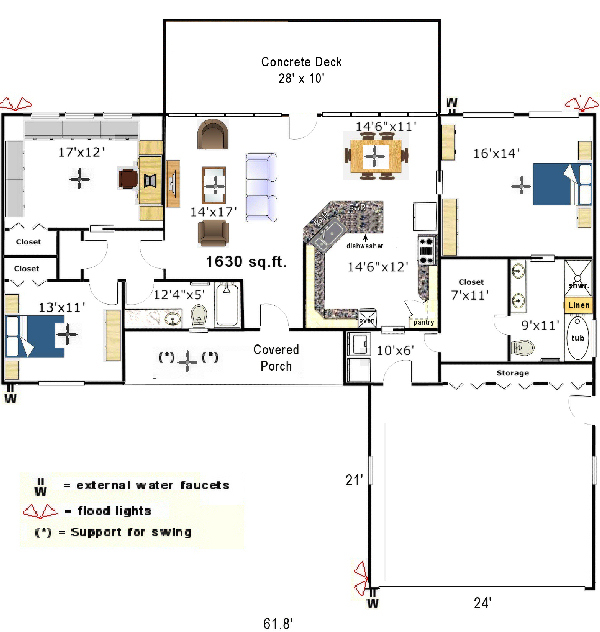 In Judy's house, we specified both phone and electric outlets on the floor under the sofa. If you don't specify this, you probably won't get it. One thing the blueprints usually do not show is the order of switches when you have several grouped together. You could hope that the electrician would choose a logical order for them, but you could be wrong. Our house has several places with from 4 to 7 light switches in a row, and they were apparently wired in random order and sometimes upside-down. For example, there is a group of four switches on a wall where the breakfast room is on the right and the den is on the left, yet the order of the switches are reversed -- breakfast room switches on the left and den on the right. There are 5 switches by the front door, and again, the order is random. The only way to be certain of avoiding this problem is to specify the order of the switches in the contract. Specifying the order of light switches may sound obsessive, but after four+ years in this house, I still cannot tell you which light switch by our front door controls which lights. I finally put labels on the switches, but you have to have the lights on to read them!! There are 3 switches in a row going into the garage, and the LAST one turns on the garage lights. Anyone visiting (and sometimes we) will turn on other lights outside the garage before getting the inside light to come on and not even be aware they have done it, then those lights get left on. The logical location for the switch for the lights in the room you are entering is FIRST. One last item about switches -- in Houston, the dishwasher was always on a switch. In this house, it was not on a switch. Sure enough, the first time I leaned over the counter and brushed up against the dishwasher, it came on. We had the builder ask the electrician to put in a switch for it. If you plan on having a hot water dispenser mounted on your sink with its tank under the sink, you will need an electrical outlet to plug it into. Since the dishwasher should be next to the sink, it can use the same outlet. We are using canned/recessed lights throughout the house, with a couple of exceptions. In the guest bedrooms, we are using light kits on the ceiling fans. In the dining room, we have a chandelier which we brought with us. So we did not have any real decisions to make about picking lighting fixtures. They look like a regular floodlights, but they are longer. The packaging said that the downlight fixture could be adjusted back for the longer bulb, but Craft (our builder) said that the best they could do still left the bulb sticking out an inch or so. This looks kind of funny, but if it means that we can go four times longer without having to change the bulbs, it is worth it. In addition to four canned lights spread around the ceiling in the den, we had 5 more put directly over the pool table for extra light. It did no good. Either the 20' ceiling is too high for even spot lights, or these fluorescent spot lights simply do not put out enough light. Instead of canned lights which will be very difficult to change on a 20' ceiling, if I had it to do over, I would mount lights half way up on the walls instead. Even with canned lights, there are some options to consider. If you have, say, four or six canned lights in your den, the electrician will probably automatically put them all on the same switch. Give some thought to whether you really want all the lights to come on and off at the same time. It's probably better to spread them over two or three switches and have the option of turning all or part of them on/off than to put them all on one switch and have no choice. In our master bath, there are separate switches for the lights over each vanity, over the shower, over the tub, and for the lights in the vent/light/heater units over the toilet and in the middle of the bathroom. 2007 Update: For Judy's house, we specified ALL fluorescent light bulbs, even in the fan kits and canned lights. In our own house, we have changed most of the bulbs over to fluorescent. The energy savings are enormous and you don't have to change them for many years. The fluorescent lights we are used to seeing are those curly kind. You can also get them in other styles: floodlights, round "bulbs", and chandelier lights with either a standard or small base. While these styles resemble their incadescent counterparts, they all have some electronics at the base of the "bulb" which makes them stick out further. Before buying a lot of such bulbs, you may want to get one (of each style) and see how they look. Specify sealed canned lights. The canned lights in our house are not sealed and bugs which get into the attic through air vents can get into the house through openings in the canned light fixtures. For Judy's house, we specified sealed canned lights which keep bugs out and air-conditioned air in. Craft told us that he always puts in inexpensive fans and that they work fine. We were concerned because in the last house we had with inexpensive fans, the fans were so noisy on low speeds that you could not use them at night. Craft assured us that they would be okay and since we were putting in six fans, we didn't want to spend $500 or more on each one to insure getting the quietest ones, so we selected cheap fans for the bedrooms, breakfast area, and living room. Our first impression was that the fans were noisy at low speeds, but they have turned out to be quiet enough so that we are able to have the fan in the master bedroom on at night at the lowest (and usually noisiest) speed. Another problem we faced was in adjusting the fan direction on the fans in the den with its 20' ceilings. This adjustment normally requires manually pushing a switch located on the motor casing of the fan, which would not have been possible in the den. Fortunately, some fans come with remote controls which let you change fan direction from the remote. But we had trouble finding remote controlled fans which had this feature and which also had a style of fan which would go in our contemporary decor (e.g. : no antique brass embellishments or wooden fan blades). Factory Firsts in Hot Springs does not stock fans with this feature, but agreed to check suppliers. They gave us a quote of just under $200 for a Hunter fan. While waiting to hear from Factory Firsts, we found a Hunter fan with a remote which had the fan direction control. It also came in white and in a neutral style we could live with. Best of all, it only cost $99 at Home Depot. The next problem with these fans is that the longest down poles Hunter makes for mounting them are only 4' long. This would have put them right in the middle of the view out the upper den windows when looking across the den from the loft. Craft had his people custom make down poles about 8' long which brought the fans down to the bottom of the upper windows. The last problem was that the fan had "reversible blades". That is, they were white on one side and wood grained on the other -- the idea being that you could install them with whichever side face down that you wanted. In our case, we wanted the white side showing. However, from the loft, we could see the tops of the fan blades, so Craft had them painted white, which was above and beyond the call of duty. If you ever have to work on an electrical outlet or light fixture, you will need to turn off its circuit breaker first. Most electricians will put some sort of description on each breaker, but not always enough to let you easily identify what breaker a particular outlet or fixture is on. For example, we have two circuit breaker boxes which contain a total of 8 breakers simply labeled "plugs". If you want to turn off power to a particular plug, you may have to flip all the breakers to figure out which is which, and this may cause some problems, such as resetting clocks to 12:00, turning off computers, etc. If there is not enough space on each breaker to note every specific outlet or switch it controls, you could give the electrician a copy of your floor plan with all the outlets and switches indicated and ask him to identify the breaker number for each one. Buss Construction did this for Judy's house and it came in handy as soon as Judy started to move in. If you can't get this done, then do it yourself before moving in and plugging in all of your stuff so that you don't have to turn off your computer, etc., trying to identify each breaker-plug combo. An easy way for one person to find the breaker for an outlet is to plug a hair dryer or loud radio into it and turn it on. When you flip the right breaker, the noise will stop. If the breaker box is outside or in some other location where this won't work, you'll just have to trot back and forth after flipping each breaker to see if the device is still on. Steel plates should be attached to studs where wiring or pipes go through the studs. This will protect the wires and pipes from nails and screws being driven through the studs when the house is done. (See the small plate on the left side and multiple plates at the bottom.) The steel plates also will reinforce the studs where they have been weakened by the holes drilled through them. But if you do not specify this to be done in your contract, it probably will not be done. If you visit the building site frequently, after the electrical and plumbing has been roughed in, take pictures of all the walls so that you can later identify where pipes and wires run. This can help you avoid puncturing them after you move in. Before walls are insulated, holes drilled into the crawl space or attic should be filled with foam created for that purpose to keep out insects, etc. Update note: This section originally discussed having the electrician run computer wiring around the house for networking computers. However, wireless networking is now cheaper and easier than running wires. Also, since we moved in, digital cable TV with high-speed Internet access as well as DSL (telephone) broadband has come to our neighborhood. And with computer prices dropping all the time, more and more people are getting his-and-her's computers and/or a desktop and a notebook. Having a network is even more desirable now in order to share the high-speed cable modem. All you need to set up a network and share a cable modem now is a wireless router, cable or DSL modem, and a wireless network card for the second computer. Most notebooks come with wireless networking built in, either standard or as an option. If your second computer is a notebook, you are now free to roam around the house (and yard) while still being able to browse the web, check email, etc. Because a wireless network card is not as fast as a wired network, and because network cable is cheap, if the two computers are located in the same room, you may want to run a wire to the second computer even if it has a wireless card. However, even if you start with both computers in the same room, I would still get a wireless router because it doesn't cost much more (if any) and gives you the option of moving your computer or adding a wireless notebook later.